Hello all you nice people, I need some help please. I have read the posts about setting up a torch (Especially Sean from Hamilton Taylor) but I have a question as I don't seem to be getting it right! Sean's instructions say to open the regulator until gas lights. 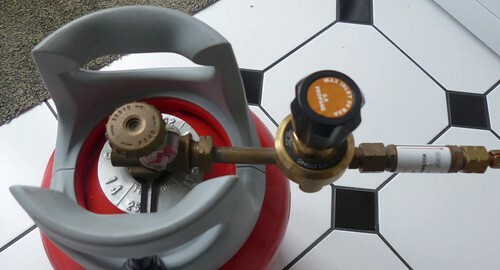 Now, I have 2 knobs on my set up, the first is connected directly to the gas cylinder and DH says that that is just an on/off valve (there is no control over the size of the flame at the torch) The other knob (see picture) doesn't seem to do anything at all, turning it fully on or fully off (or anywhere in between) doesn't make any difference to the flame, is that right?. The result is that I only have to turn the torch on the tiniest bit to get a usable flame and, judging by the instructions, this isn't correct, or is it?. Turn the main gas valve (on the cannister) fully on. That way there can be no doubt about which way to turn if you need to close it down in a hurry. Then open your torch valve (I usually go about half way) and keeping an open flame under the torch, turn up the regulator until it lights, then adjust to about 6" of flame. This sets the regulator at the right pressure. Then carry on as per Sean's lovely instructions, which I really must remember to turn into a sticky! Thanks George but when I do this I get a flame thrower. Would I be right in thinking that the black knob should be a regulator, because it doesn't make any difference where it is set, it always seems to be fully on (even when I turn it fully off)! Black knob with orange label in middle = regulator, on the side of it further down should be black numbers, turn the knob so it sits around the number '4' mark. Thanks Lou, I have just been and looked at the black knob, I have never noticed the numbers before (in my defence they are always facing away when I set up!) It is currently set as far as it will go, which is very close to the 4. I will try changing it again next time I set up. Is the higher number more gas or less (sorry to ask such a silly question)? As I mentioned before this knob doesn't seem to have any effect, any chance that it is faulty do you think? Higher number is more gas. And yes, I have had faulty ones in the past. it should change the gas flame for sure when you turn it, but it sometimes takes a minute or so, so turn it all the way one way, then wait and see what it does, then turn it all the way the other, if its doing nothing then somethings not right, can you take it apart and put it together again possibly? The number 4 should be lower - so maybe 6 turns to this position, should not be at the top, so the bottom of the black knob hovering flush around 4. I always shut everything down after every flame working session for safety. Thank you all for your help. I don't have a dedicated lampworking area so have to set up in the kitchen every time I want a session. I will have a play on Friday to see if the regulator is working or not, hopefully it is and it is just me being inept! I have had a 'play' with my set up and it was a bit of a nightmare! I discovered that the regulator was actually doing something only the effects were delayed, I am guessing because of the pressure of the gas already in the pipe. Anyway I managed to get what I thought was a reasonable setting and started to make a bead, only to find that the flame started to get smaller and smaller. I changed the regulator to get a reasonable flame and started again but the same thing kept happening. I thought that maybe I was low on gas but the gauge said not, just to make sure I swapped to a new tank from the motorhome, same problems. Just 'wobbling' the knob on the regulator made a massive difference to the flame (from none to flamethrower!). The upshot of this is that I think I need a new regulator , I think my current one must always have been faulty because it has never been used (I am ashamed to say I didn't know what I was supposed to do with it! ), but I have had it some time so a bit late to complain. When I turn the setup off I usually turn the gas bottle off first. 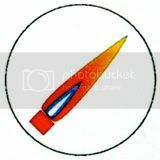 Then as the flame starts to get smaller on the torch I turn the oxygen off at the torch and adjust the propane as required. Then when the flame has died on the torch I turn off the regulator fully and then the propane controls on the torch. This ensures there is no gas pressure left in the system. Finally I turn off the oxycon and open the oxygen control on the torch to bleed any residual oxygen pressure in the system. Once this is bled I close the oxygen controls on the torch. This ensures there is no residual pressure left in the system. You can use a hothead on a bulk propane kit on its own as it's a single fuel torch, but my understanding is that the minor burner is a dual fuel torch and needs extra oxygen via either a canister or an oxygen concentrator, otherwise it will do exactly what yours has done - use up the oxygen in the surrounding area and blow itself out! Before you condemn the regulator as faulty, I'd try winding it fully open then fully closed a few times, with the gas turned off at the cylinder, just in case something is sticking. Then try setting up again. I have the same regulator and set it to 3.5. Jane - yes I do have an oxycon , I am not sure that that is doing what it should either, the red light keeps coming on. Once I get the gas sorted I will look into this! Moira - While 'playing' I was winding it up and down and I don't think anything is sticking (I think the opposite ). Nick - thank you for all your advice, I will take it all on board (I already do some of it when I put my system away). It is interesting that you say that there should be the same pressure to turn the regulator because that is definitely not the case, it gets 'easier' moving from 4 bar to 1 bar and there is a definite wobble as you move away from 4 bar. I am still of the opinion that I need a new one, I will look into the companies that you recommend.